This recipe is my dear neighbor Lisa Zimble’s favorite. 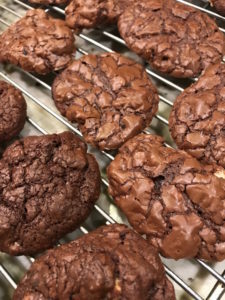 She likes it so much that she has declared a ‘cookie war’ to challenge this recipe as the best cookie recipe ever. I’m totally not a fan of white chocolate. But I have to say that I like this recipe and the white chocolate chips are not offensive. However. . .. Lisa, I can’t say that I think it’s the best cookie recipe ever. I still think that the chocolate chunk shortbread from last week reigns. . .. I’m counting on David Paris to concur but we shall see. Anyone else got one? In a heavy saucepan set over low heat, melt chocolate and butter stirring to avoid burn. Once melted, set aside to cool a little. In a mixing bowl, with the whisk attachment, beat eggs and sugar until mixture is pal and very fluffy, about 2 minutes. Beat in vanilla extract. Scrape melted chocolate into the egg foam and beat until just incorporated, scraping down the sides of the mixer bowl with a spatula. Beat in the flour mixture until no traces of flour remain, scraping sides of mixer bowl. Using a spatula, fold in the chips, cherry and nuts. Drop scant tablespoons of batter, two inches apart, onto the baking sheets. Sprinkle with sea salt if you like. Bake until slightly risen and a thin crackling crust forms on the tops of the cookies about 9 to 13 minutes depending on size. Do not over bake! Use a metal spatula and immediately transfer the cookies to a wire rack to cool.